wrong place wrong time. I’ll miss you puppy. Click my photo to watch my video! Peaches is believed to be a 6-year-old terrier mix that our partners Home for Good Dog Rescue saved from a kill shelter called Jenkins County K911 in Millen, Ga. Peaches was pregnant at the time and the shelter planned to euthanize her after she had her puppies because they couldn’t afford the heart-worm treatment she needed. Peaches has a deformed front leg that we think she was born with. The vet at Home for Good’s Aiken, S.C., care facility noted that she uses the leg for balance and to rest on and, since it doesn’t seem to be bothering her, he decided against amputation. By all accounts Peaches is a super-friendly dog with a great personality. We are sponsoring Peaches to help pay the costs of the medical care she needs. Home for Good has a great success rate in placing animals with some disabilities so we are expecting to see a healthy Peaches on her way up to New Jersey soon to find her forever home. Home for Good Dog Rescue, based in Berkeley Heights, N.J., has saved more than 6,500 dogs in its eight years of existence. The Tess McIntyre Foundation regularly sponsors some of those dogs, providing support to help with the medical care for some of HFG’s neediest cases. The Tess McIntyre Foundation is a 501(c)3 charity that raises funds to support rescue organizations. The foundation focuses its effort on dogs that need medical care to get them in shape to be adopted. 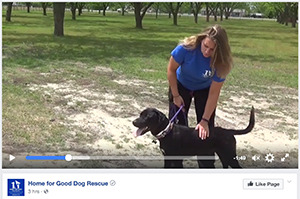 Home for Good, based in Berkeley Heights, N.J., is a volunteer and foster based organization that rescues dogs from kill shelters in Georgia and South Carolina. Aiden's Story Update: Watch this great video! Donations to The Tess McIntyre Foundation are tax deductible. The Tess Foundation is a non-profit, 501(c)3 charity.